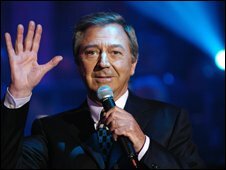 Entertainer Des O'Connor says he was "delighted" at becoming a CBE in the Queen's Birthday Honours for services to entertainment and broadcasting. A former Butlins Red Coat, his career in showbusiness spans more than 50 years, and has included cabaret, talk shows and even a number one record. O'Connor was born in the East End of London in January 1932 before being evacuated to Northampton in the war. After National Service in the RAF, he decided to try showbusiness. He was soon appearing in variety shows around the country. O'Connor's journey to stardom took off when he was given his own television series, The Des O'Connor Show, in 1963. He went on to have his first hit single in 1967 with Careless Hands, followed by I Pretend - which went to number one in the UK. Since then his recording career has produced 35 albums with sales of over 16 million. 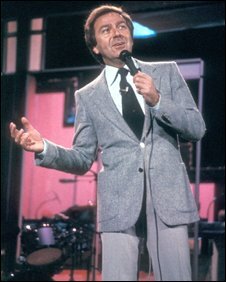 In 1977, he began hosting the Des O'Connor Tonight chat show which went on to run for 25 years. In total, he has made over 1,000 performances at the London Palladium. He received the Lifetime Achievement Special Recognition Award at The National TV Awards in 2001 and a year later teamed up with presenter Melanie Sykes to co-host Today with Des and Mel for a four-year run. O'Connor went on to replace Des Lynam as the host of Channel 4 quiz show Countdown in 2007, which he currently presents. The 76-year-old star married his fourth wife, Australian-born Jodie Brooke Wilson, in 2007 after a 17-year relationship. Together they have a son, Adam, who was born in 2004. He has four children by his previous wives.